When a seminar I was attending was scheduled in Kachanaburi, Thailand, I was excited because I would get to see the bridge over the River Kwai, where that famous story had taken place. And when I got there, I wasn't disappointed by the place. It is a beautiful setting, with a tropical jungle feeling all about. The river itself is a muddy brown color. 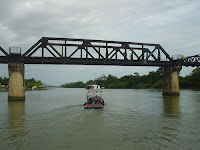 The bridge is a black steel, which contrasts with the jungle colors of life. I was able to visit the museum on the opposite side of the river from where I stayed, and to walk across the bridge back to the hotel. I visited the cemetery in town where many British soldiers had been buried, killed upon foreign soil. The romance of the story is strongly felt in a visit to that spot. The suffering of the POWs who put together that bridge, and the whole of the Burmese Railway. It was torturous, and the museum there shows just how mangled their bodies became in the process. It is a spot worth visiting. It is a sobering experience, as is a visit to many of those sites that make one aware of the bitterness caused by war in Southeast Asia.